I've always suffered with fairly dry skin, but the recent cold weather has been leaving it feeling very parched and flaky. Lately no amount of moisturiser seems to quench it's thirst so I decided to search for a hydrating mask. Whilst browsing the shelves in Boots I came across the 'Super Facialist' line by Una Brennan - I'd never heard of the brand before, but the luxe packaging and student-friendly prices lured me in. Despite not being a fan of rose-scented products, I decided to pick up the Intense Moisture Mask after skim-reading a number of positive reviews on Google. Anxious to get home and put it to the test, I hoped it would transform my scales into baby-soft skin! The claim: "Boost skin moisture levels and radiance with Superfacialist thirst-quenching Intense Moisture Mask developed even for the most sensitive skins. It expertly blends White Willow extract, known to enhance skin cell turnover, Vitamin E and Urea with soothing Marshmallow extract to effectively hydrate, plump and replenish skin. Complexion appears calmer and visibly renewed, glowing with a healthier radiance." Packaging: The mask comes in a squeezy tube which proves handy; it's nice and hygenic and I don't end up with any wasted product. As I mentioned previously, I'm also a fan of the chic design - I think all of Una's products look they're from a premium brand rather than a more affordable drugstore line. Application: The product looks more like a moisturiser than a mask, however when applied to the face it sits on the skin rather than settling in. Many clay masks often make my face feel quite tight and uncomfortable while I'm waiting for them to develop; however this one had a pleasant warming effect on my skin and made me feel nice and relaxed. Also, to my delight, the rose fragrance isn't incredibly strong and doesn't tend to linger. The tube instructs you leave the mask on for 5 minutes, but I've been leaving it on for longer for an extra hydrating treat. Results: After gently washing the mask off with warm water and a muslin cloth, I instantly noticed a difference to my skin - it felt smoother, softer and much more hydrated. Since then I've been incoorporating the mask into my skin routine, using it twice a week or whenever I feel my skin needs a bit of a boost. While I usually apply it before bedtime before smothering my face in moisturiser, I've also been using it prior to nights out or special occassions if I've got 10 minutes to spare - my make-up always sits on my skin much nicer and it gives my complexion a nice healthy glow! 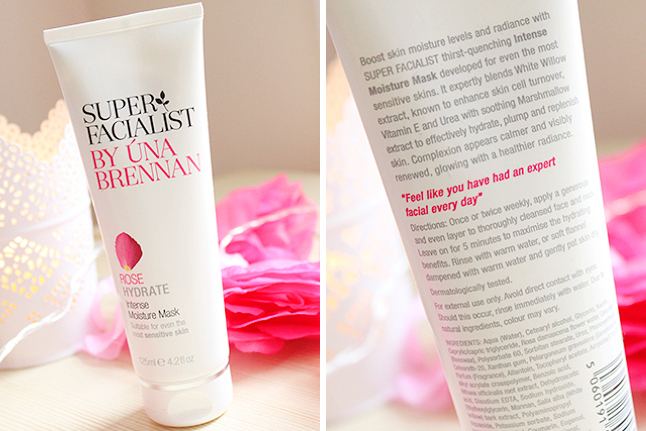 While this doesn't quite perform miracles (which I didn't expect it to for £8.99), Una Brennan's Intense Moisture Mask is a lovely little addition to my skin care routine and I'll be reaching for it everytime I feel my complexion needs a bit of TLC. While this probably won't be an essential during the warmer months (my skin only tends to suffer during winter time) I'll definitely enjoy using it up. I'm also excited to try more products from Una Brennan's brand - I've got my eye on the Rose Hydrate Radiance Day Cream and the Vitamin C Skin Renew Cleansing Oil next! I've currently got the Una Brennan Tea Flower Mask atm and really like it, but I don't think its doing much for my skin. Maybe this version you have spoken about would be much better for me! This is such a good range at being affordable. I haven't tried much from this range but anything rose will always sell me!